General Characteristics: Tall, erect, stocky, maturing within 9 to 12 months, producing from 2 to 5 oha; recognized by purplish-black petioles with pinkish edges. Petiole: 100 to 140 cm. long, purplish-black with pinkish edge, light green at apex, a dark red ring at base with pink for 1 to 2 cm. above. Leaf blade: 40 to 60 cm. long, 30 to 40 cm. wide, 35 to 45 cm. from tip to base of sinus, sagittate, slightly concave, dark green; margins with a few large undulations, the marginal veins purple; piko small, purplish; lobes obtuse with narrow sinus. Corm: Flesh white tinged with pink, especially near the apex, with yellowish fibers; skin light to brilliant dark pink and occasionally purple along leaf-scar rings. Origin, and derivation of name: Native variety; the suffix ula refers to the pinkish color of the edges. Distribution: Planted somewhat extensively in the uplands throughout the islands, particularly in Kona. Use: Grown mainly for home use as poi taro. 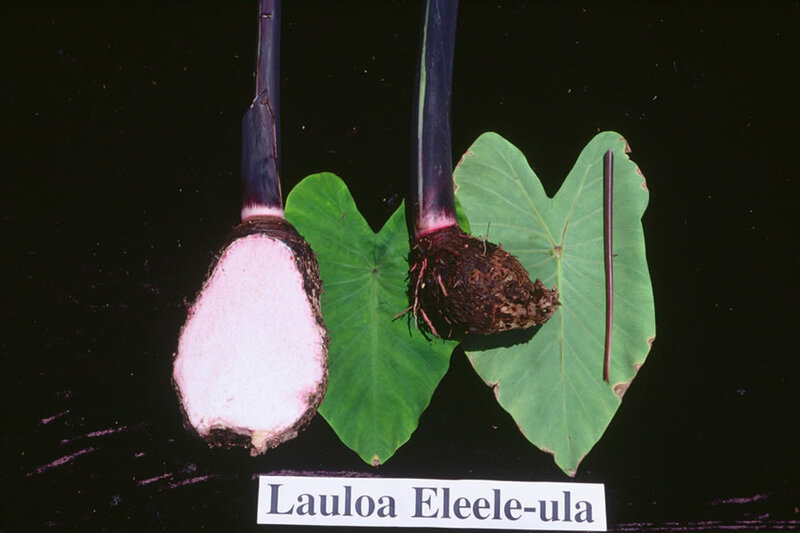 Remarks: Although in vegetative characters this variety is very similar to the other Lauloa, and it has occurred as a mutant form, in corm texture and quality of poi it is more closely related to the Eleele group.